Jelena McWilliams officially took over the helm of the Federal Deposit Insurance Corp. in June. Her resume includes stints as chief counsel of the Senate Banking Committee, an attorney at the Federal Reserve, and chief legal officer at Fifth Third Bancorp, a Cincinnati-based regional bank. She replaces Martin J. Gruenberg, who, for now, remains on the FDIC board. Some Democrats would like him to take over the open vice-chair seat, left vacant after Thomas J. Hoenig retired at the end of April. Gruenberg has not indicated what he wants to do. His board term is over at the end of 2018. Look for Comptroller of the Currency Joseph Otting to spend this year “reducing unnecessary regulatory burden.” He told the House Committee on Financial Affairs that his short-term goals are to modernize the regulatory framework around the Community Reinvestment Act , help consumers with “short-term, small-dollar credit needs,” make anti-money laundering compliance more efficient, simplify capital requirements and the Volcker Rule. “Bankers understand the risks facing their banks better than at any point in my 35-year banking career,” he said. While Comptroller Otting revealed his personal priorities for the OCC, the agency also disclosed its regulatory areas of focus in the Spring 2018 Semiannual Risk Perspective. With strong loan growth, especially in commercial real estate, regulators are emphasizing the need for strong credit risk management, especially for concentrations. Examiners are also concerned about how rising interest rates will affect deposits. “Banks may experience unexpected adverse shifts in liability mix or increasing costs that may adversely affect earnings or increase liquidity risk,” the OCC warned. It also noted that history may not serve as a good guide for what will happen due to the high levels of non-maturity deposits that were acquired during an unnaturally low interest rate environment. The primary regulators have proposed a revision to capital rules to help banks identify which credit losses under the CECL accounting standard are eligible for inclusion in regulatory capital. The proposal also replaces the term “ALLL” with ACL (allowance for credit losses). The proposal will allow banks to phase in over three years the adverse impact of CECL on regulatory capital. Five years after the Volcker Rule was finalized, agencies have issued a 494-page proposal to improve the rule, which banned banks from risky proprietary trading. Regulators said the final rule was “unclear and potentially difficult to implement in practice.” The rule would be tailored “based on the size and scope of a banking entity’s trading activities,” which should reduce compliance costs for smaller firms. It would also exclude from the definition of proprietary trading any securities sold as part of a liquidity management plan. 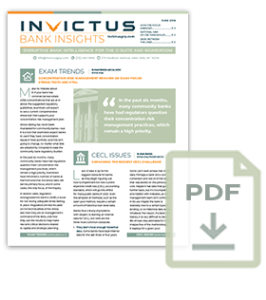 The Federal Financial Institutions Examination Council issued a new policy statement for ensuring that bank regulators coordinate on formal corrective actions. The regulators say they want to make sure that all the agencies are on the same page as early as possible, especially if more than one regulator has an interest in the outcome. Regulators may, for instance, want to bring a complementary action against both a bank and its parent holding company. In such a case, the agencies “should coordinate the preparation, processing, presentation, potential penalties, service, and follow-up of the enforcement action,” the statement says.